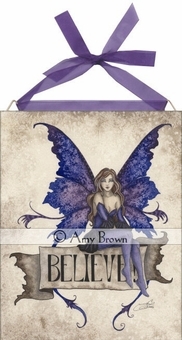 This fun piece features a fairy sitting atop a sign that says "BELIEVE!" The pixie is dressed in blue, with corset, sleeves and stockings and a black skirt. Her indigo butterfly wings spread out behind her. A lovely and inspirational addition to any decor!